Engagement rings aren’t always traditional. Not every future bride wants to say “yes” to white metals and shades of blush or yellow gold. Some want to take a step into the darkness with deep hued ebony engagement rings that steal their inspiration from the night. These bewitching rings hold a gothic appeal, an eternal beauty and they refuse to hide in the shadow of convention. Black engagement rings embrace velvet elegance and deliver an ethereal magic that their classic counterparts cannot match. 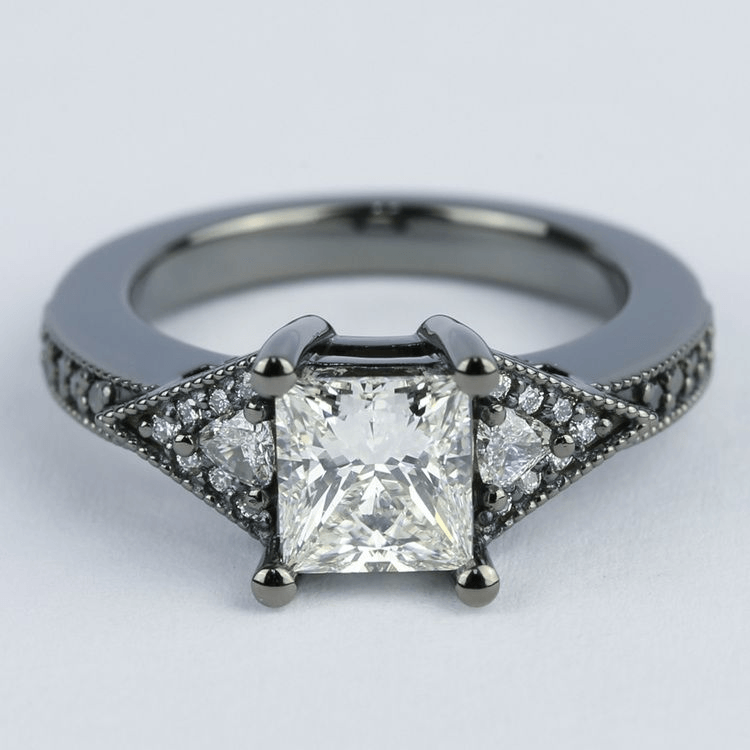 Say yes to the black magic of ebony enchanted engagement ring designs…and embrace the beauty of the darkness. White colorless diamonds are classic, sure. But black diamonds are otherworldly—quite literally. Scientists believe that black diamonds feature a composition that is distinctive of an interstellar origin. Because of this origin—and the high quantity of graphite, pyrite, or hematite in their makeup—these stones tend to be highly included, and were not considered valuable until recently. Since black diamonds do not follow typical diamond color or structure, they are not graded in the same way as clear diamonds. 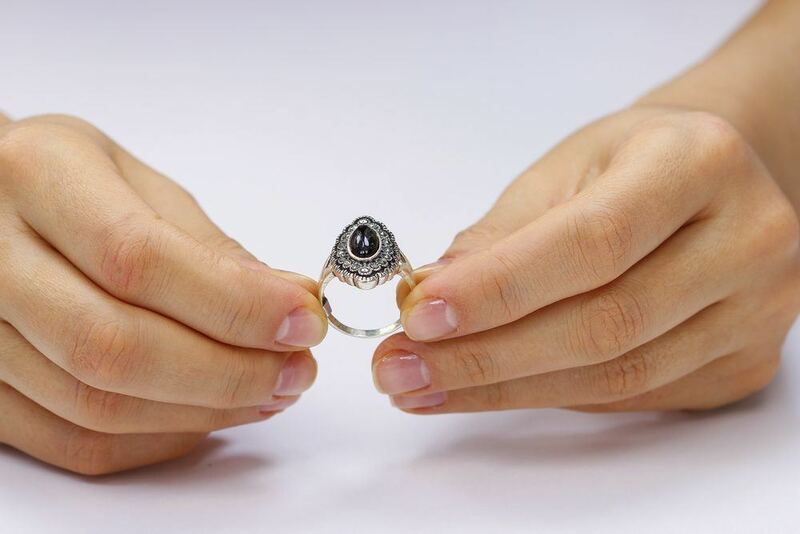 However, the GIA and other laboratories still provide certification for black diamonds, and this documentation serves as proof of the stone’s quality and authenticity. Black diamonds can be cut in different shapes and sizes, and these dark beauties look amazing as centerpiece stones—especially in light hued metals like platinum and white gold. If you think that sapphires only come in blue or pink, think again! Sapphires are available in a wide range of hues—including black! Like black diamonds, these stones look amazing when used as center stones for engagement rings, and they pair well with other hues of sapphires (or diamonds!). 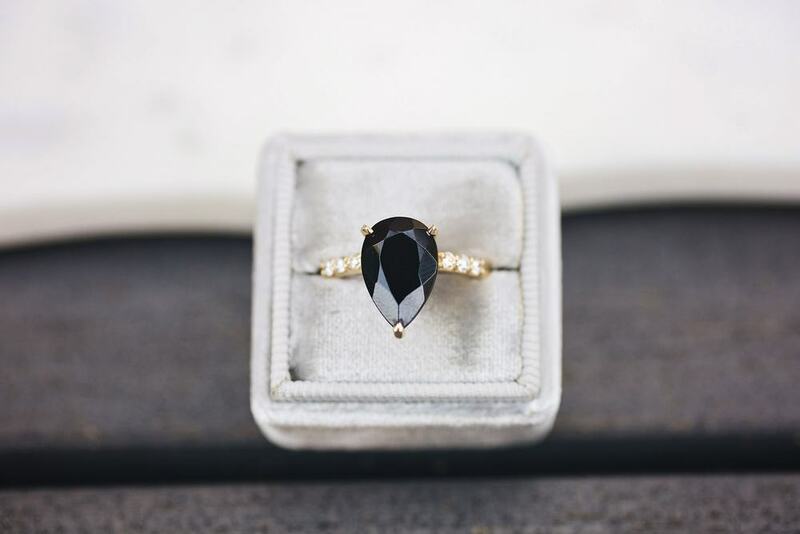 A classic midnight hued gem, onyx can be cut as a flat design or into a bead-like cabochon for a unique center stone. Onyx is opaque and delivers a shiny backdrop for clear and colorless diamonds to showcase their brilliant fire. Pearls also look amazing when set next to onyx and they, too, can be used in halo designs to frame an onyx cabochon. Most buyers know of opal as a rainbow-hued gemstone, but opals have many color variants—including black. Don’t be fooled, though; black opals aren’t completely dark in hue. According to the GIA, black opals feature the typical rainbow spectrum of hues set against a darker backdrop within the gem. Black opals make unique center stone choices and pair well with almost any other gemstone or metal hue. Opals are softer, so this gem might not be the best choice if you live an active lifestyle. For more black magic, use darkened metals as a backdrop for your ring. Cloak your engagement ring in all black with a deep hued center stone set against black metal. Or use a dark metal as a black canvas to draw attention to your clear or colorful center stones. 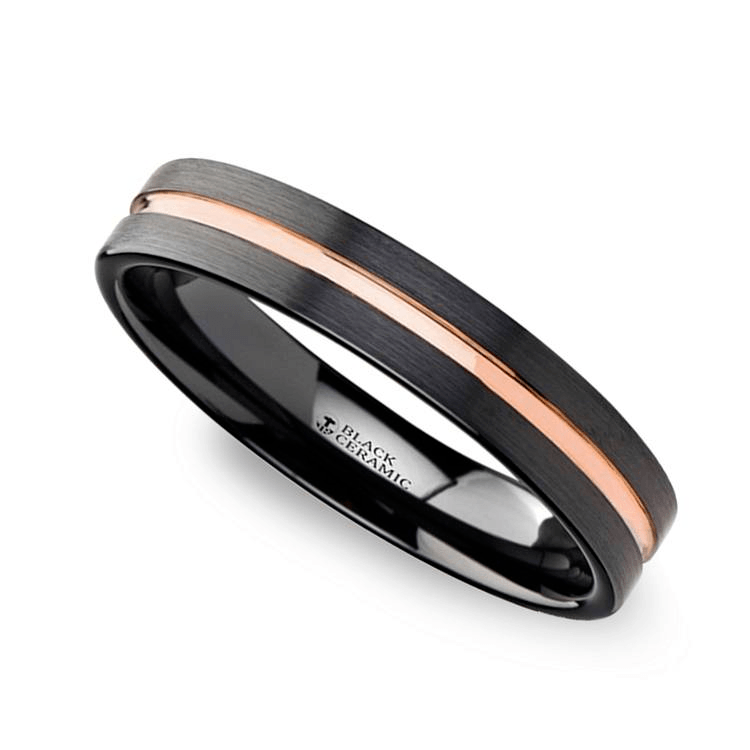 Yellow, rose and white gold have a darker sibling! While other hues of gold are created by mixing in other metals, black gold can be created through a variety of different techniques, including external coating, electroplating, heat treatment, and controlled oxidation. The final finish is a blackened metal that looks nothing like traditional gold. For a vampish appeal, choose red gemstones, like rubies or garnets, to decorate the dark setting. Typically, engagement rings feature a gold or platinum setting, but for an alternative look, an alternative metal is the way to go! 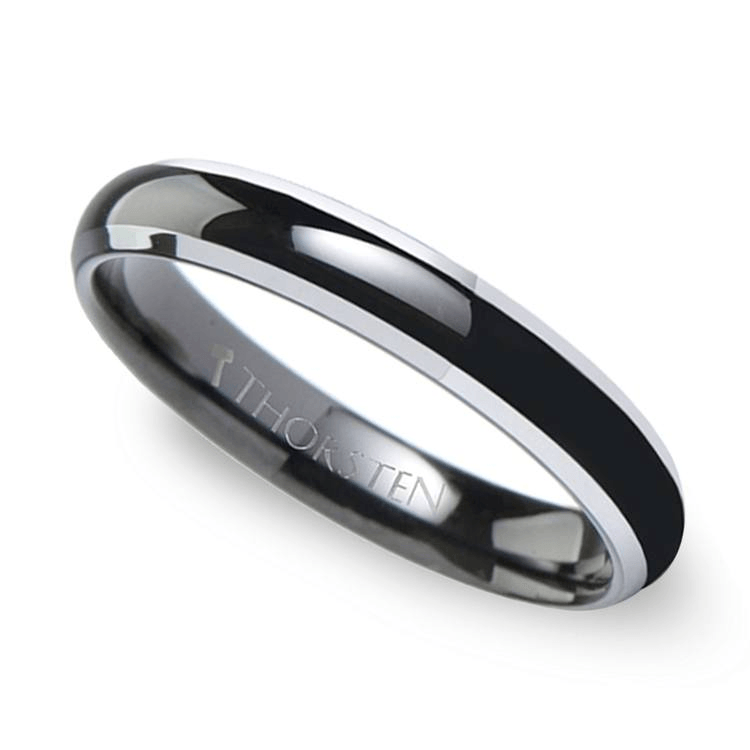 Tungsten is most commonly used in men’s wedding rings, but can be used to create a unique engagement ring. In its regular form it is a white metal, but it can be darkened to create a black setting. 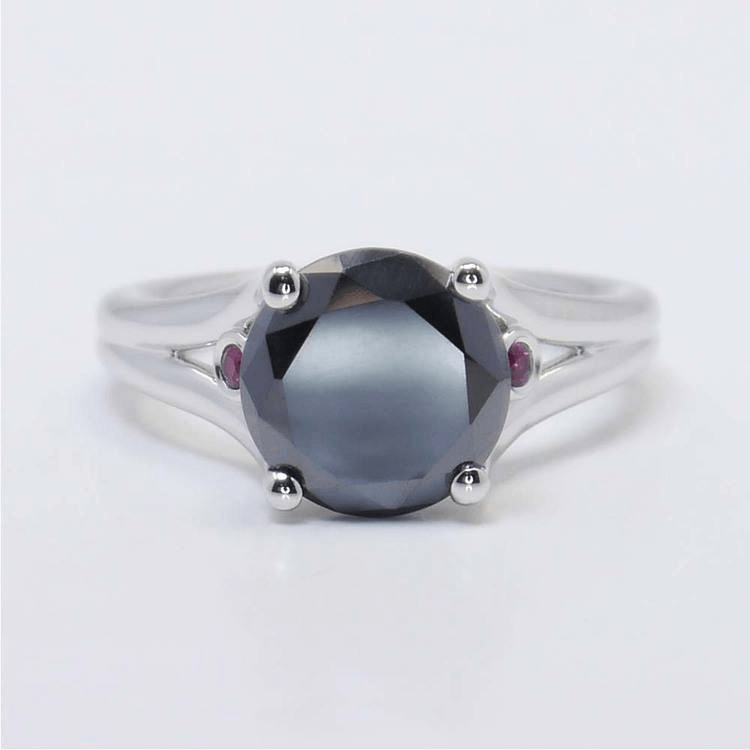 This dark design is ideal for showcasing clear white diamonds, pink sapphires or other vivid stones. For a truly budget-friendly dark drama, opt for black ceramic. This is the only material that isn’t a metal, but it does make for a durable ring backdrop. The ceramic material used for fine jewelry won’t shatter or crack like traditional ceramic, so this is a safe setting for semi-precious gemstones. However, be cautious when choosing this material for expensive diamonds, as it isn’t as durable as most metals. Talk to a jeweler about what gems are best to set within stunning ceramic. Black hued engagement rings take traditional designs into a darker dimension. While bold black engagement rings aren’t for everyone, individuals who crave a unique style, and other unconventional designs, will fall in love with the dark beauty and black magic of these dramatic rings!